Good morning, everyone! The poster sessions for Sunday and Monday were well attended. Several posters are on display in Exhibit Hall A. 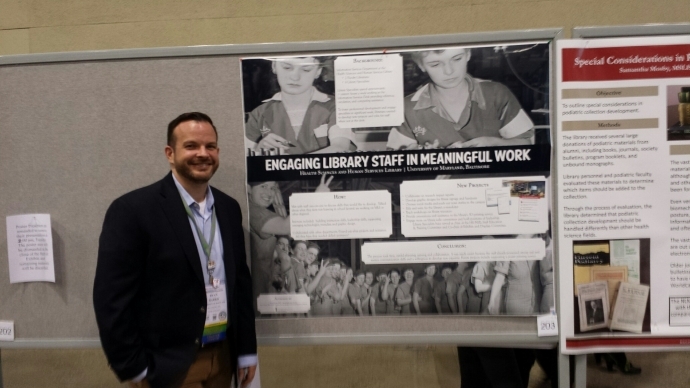 In poster session 1, I spoke to Ryan Harris from HSHSL in Baltimore, MD, USA, about his and Everly Brown's poster on how to engage library staff in meaning work and, in poster session 2, I learned about how our Canadian colleague, Susan Baer, Amy Weisgarber, Michelle Dalidowicz and Robyn Hocking are implementing a journal club online for clinicians. It looks like several good conversations were happening at each session. You can find the poster titles and authors listed on page 44-52 of the Official Mosaic 2016 Program to see the full list of titles, topics and authors. If you have a particular research or service project interest, you may find future collaborators or at least meet people pursuing the same type of projects. There is one more round of posters on Tuesday in Exhibit Hall. Ryan Harris, Susan Baer and Robyn Hocking have provided permission for posting pictures of themselves and their posters in this blog.